As an avid enthusiast of both car and motorcycle grand prix, I am a huge John Surtees fan as he was the only person to have won a championship in each. 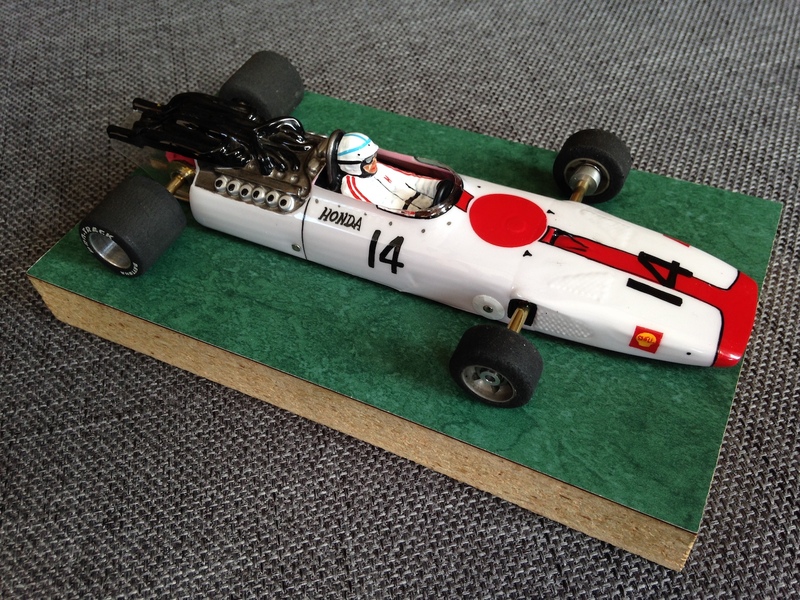 So when he died, I decide to do a Honda RA300 tribute car which I think is gorgeous (albeit not a great car). Sadly, that body is not available (TrueScale used to sell a RA301) but the Ferrari 312 is similar in that both used 60 degree V12 engines with central exhausts and sideboard carburetors Picture attached and my complements to Noose for yet another awesome paint job! Now I want to build a real Ferrari 312 F1 car (this one will be a Chris Amon car) but unfortunately can't seem to find anymore narrow Lancer bodies. Outisight makes one but it's both shorter and wider than the Lancer body and to my eye, just doesn't look as good. Neckcheese, I've always loved what you guys are doing over in Europe with vintage F1 cars. Any chance you'd know where I might acquire either the Lancer body or something comparable? I have a True Scale "TSR18 Ferrari F1 Lancer Retro Body" available in either Lexan or PETG. Nice looking car by the way. Thanks Rick for both the complement and for having the body I need!